PTT, or Push-to-Talk, is a very popular feature among cell phone users because it allows for instant connection with business associates and other contacts without having to dial up their individual phone numbers first. It works much the same way as walkie-talkies do (it is sometimes referred to mobile walkie-talkie), except PTT operates over a cellular network, rather than connecting the two parties directly. What exactly is Push to Talk and how does it work? PTT is a "half-duplex" system, meaning that you can only send or receive a transmission at any given time. When the PTT button is pressed and held, you can talk to any number of your PTT buddies (though they must be on the same network as you) directly and instantly. This message can be sent to one or more contacts at any given time, depending on your needs. When the button is released, you are back in "receiving" mode and any transmissions made over that frequency and intended for your reception will be played over your cell phone's speakerphone. In this way, Push to Talk is considered a half-duplex system, as opposed to a full duplex system like conventional mobile phones. With full duplex systems, you must call up the number of the other party first before any transmission can be made, this connection allows for simultaneous sending and receiving of "voice data", and this connection remains fully open until one party ends the call. One of the most popular technologies used for Push to Talk services is iDEN, developed by Motorola. 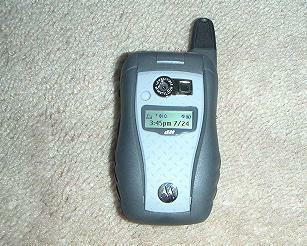 As such, several of the PTT-ready handsets you see on the market are either Motorola-branded or Motorola-developed. While family walkie-talkies are very commonly used on camping trips so that family members can quickly and easily remain in contact with one another, Push-to-Talk appears to be a much more urban phenomenon. When initially offered to the public, it was marketed as a business solution that would allow on-the-road sales teams, for example, to have a quick, convenient way of staying in touch. Entire teams could be contacted with a single push of the PTT button, each member could promptly report on their status, and so on. This usage was showcased on the hit television series The Apprentice with Donald Trump. More recently, increased popularity of (and marketing for) PTT among younger consumers (15-30) has been seen. This is perhaps best evidenced by MVNO (mobile virtual network operator) Boost Mobile's "Chirp" service, accompanied by its hip, trendy catchphrase: "Where You At?" House parties can be organized in a matter of minutes, shopping friends can instantly tell others about the best sales at the mall, and road trips involving several vehicles are less likely to lose anyone along the way. As with any cellular service, the cost of Push-to-Talk varies quite widely depending on mobile operator, calling plan, and a host of other considerations. As a general rule of thumb, conversations over PTT do not count against the included minutes in your regular cell plan. It is a separate service with a separate set of charges (though it can be an integral part of your cellular solution). Some operators will offer PTT for $1/day, providing discounts with monthly plans, increased usage, and corporate accounts. Many business plans include full PTT services. Check with your favourite network operator for details. PTT services are offered all around the world. In Japan, you can enjoy Push-to-talk with NTT DoCoMo. Avea does it in Turkey, Claro in Brazil, Telstra in Australia, and Hutch in India. This is but a small sample. In Canada, the two major CDMA (Code Division Multiple Access) cellular operators provide Push-to-Talk: Bell Mobility markets it as their 10-4 service, primarily making use of Sanyo cell phones; and Telus Mobility inherited the "Mike" PTT service when they purchased Clearnet Communications. Lesser-known Aliant Mobility also offers PTT. In the United States, you'll find PTT with many service providers: Cingular, Boost Mobile, Sprint-Nextel, and Verizon Wireless.